I've been perpetually tired, but having a hard time going to sleep. I've decided it's because I'm not writing enough. So I'm determined to get my blogging mojo back!! Sylvia's opening weekend of her show went so great! We're all having tons of fun, even if it does mean we have way less "free" time. 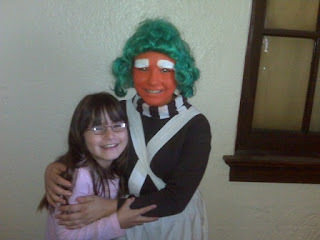 Here she is (with her sis) in all her Oompa Loompa glory. As my loyal readers know, I'm a huge fan of The West Wing. So you can imagine how excited I was to see Toby Ziegler (aka Richard Schiff) live and in person! He actually said hello to me! So I told him I watch West Wing every day of my life. And he suggested I get out more. We had a good laugh. And it makes me smile every time I think about it. Thanks to everyone for the kuddos. I purposely did not get into how much I've grown and changed because, frankly, I get nauseated even trying to write that anymore. I mean, yes, I know, I've accomplished a lot, and I'm doing a good job, but I feel like I've written all of that before. But I felt warm all over, reading your comments! Thanks for that. I was really hoping this week would be quieter, what with no rehearsals and all, but sure enough, I was supposed to go to Open House at the Club (which I blew off), and I have Back to School Night at Sylvia's school this week. I'm beginning to realize that any efforts to slow down our schedule at this point are an exercise in futility. It is what it is. I told Sylvia that I'm a little concerned about re-entry issues. I think, for people like us, it's easier for us to juggle a lot of things in the air, but the more free time we have, the more our productivity wanes. She did her homework without any fuss, so I hope that I was worrying about nothing. Still, I will not add any more titles for the remainder of the school year. Between the PTA, the Booster Club, the Leadership class, the Club committee, as well as parenting, working, blogging here and at Parentella, I think I've reached my cap on commitments! Granted, this is a pretty lame post, but hopefully, I'll have something of substance to say soon! I always enjoy reading your posts, April. Sometimes we have less to say or are less passionate about what we're putting out into cyber-space but blogging is a part of who we are, isn't it? Look forward to reading more from you - should that be the case! Sylvia is the cutest Oompa Loompa! Great costume! I am so glad opening weekend went so well. That is the best oompa loompa ever. Are you all singin' the songs? Over and over and over and over?....because now I am. See now, Mindy is WISE! I was going to say almost the same thing, and tell you of course, how you should eat more bacon because that will, of course, make you happy.